Contains: Paprika, Pepper, Cumin, Cassia, Cloves, Coriander Seed, Cardamom, Nutmeg. Description & Use: Baharat may be best described as an exotic spice blend that fills your head with diverse aromas, is not hot, yet conveys all the romantic fragrances of everything that is spice. 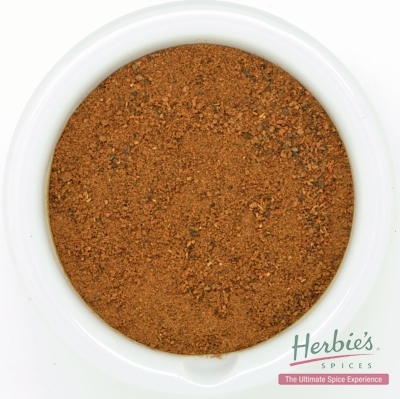 A traditional mix of Baharat, added to recipes in much the same way as Indians would add garam masla, is made by blending a well-balanced combination of sweet, pungent, hot and amalgamating freshly ground spices. The result is a beautifully balanced spice with a woody bouquet, aromatic bay-rum notes, mellifluous cinnamon/cassia sweetness, deep pungency and an apple-like fruitiness. The flavour is round and full-bodied, sweet and astringent yet with a satisfying and appetite-stimulating pepper bite. While each spice makes its own distinctive contribution and may leave one with a lingering hint of its individuality, no single flavour should dominate. Baharat adds a nuance of the exotic Middle East to winter warming dishes and is delectable rubbed onto lamb shanks that are browned in a pot and made into a casserole. Baharat compliments lamb so well, cutlets and even roasts are improved greatly when the meat is dusted with Baharat and a little salt to taste, allowed to dry-marinate in the fridge for an hour and then cooked.